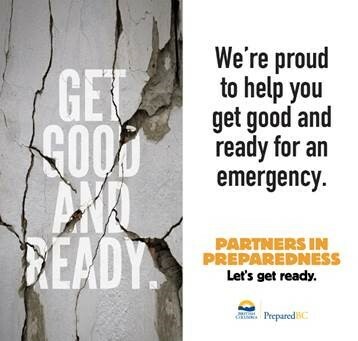 SOS Emergency Response Technologies has joined the Partners in Preparedness campaign with PreparedBC. Our hope is to make it easier for you to get ready for an emergency by helping you understand what should be in an emergency kit and make it easy for you to have access to supplies. If there was a major emergency in BC would you know what to do? Would you be prepared? Experts recommend that all families have a minimum of 72 hours of supplies on hand and be able to manage without power or water for that period of time. Some key items to have on hand: Emergency Food Rations, Emergency Water (minimum shelf life 5 years), communication devices (think hand-crank or solar), blankets for warmth, first aid supplies, sanitation supplies, cash, walking shoes, & duct tape. School and PACs fundraising Tired of the same old fundraisers? PACS, Daycares, sports teams, dance schools and more have all had success with our Earthquake Kit fundraising program. Prepare your families & help your community be ready for ANY emergency and raise up to $19/kit bought for your PAC and/or club. Call 604.277.5855. Workplace Purchase Programs Do you want to provide your staff with an opportunity to purchase Earthquake Kits for personal use at wholesale prices? Let your staff know you want to help them be prepared for ANY emergency when they are away from the office. SOS Emergency Response Technologies has a great purchase program that includes free delivery to the workplace. Call 604.277.5855.